In ancient Rome, Auctoritas referred to the general level of prestige a person had in Roman society, and, as a consequence, his clout, influence, and ability to rally support around his will. Auctoritas was not merely political, however; it had a numinous content and symbolized the mysterious "power of command" of heroic Roman figures. Noble women could also achieve a degree of Auctoritas. For example, the wives, sisters, and mothers of the Julio-Claudians had immense influence on society, the masses, and the political apparatus. Their Auctoritas was exercised less overtly than their male counterparts due to Roman societal norms, but they were powerful nonetheless. According to French linguist Emile Benveniste, auctor (which also gives us English "author") is derived from Latin augeō ("to augment", "to enlarge", "to enrich"). The auctor is "is qui auget", the one who augments the act or the juridical situation of another. Auctor in the sense of "author", comes from auctor as founder or, one might say, "planter-cultivator". Similarly, auctoritas refers to rightful ownership, based on one's having "produced" or homesteaded the article of property in question - more in the sense of "sponsored" or "acquired" than "manufactured". This auctoritas would, for example, persist through an usucapio of ill-gotten or abandoned property. 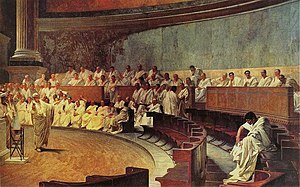 Politically, auctoritas was connected to the Roman Senate's authority (auctoritas patrum), not to be confused with potestas or imperium (power), which were held by the magistrates or the people. In this context, Auctoritas could be defined as the juridical power to authorize some other act. In the private domain, those under tutelage (guardianship), such as women and minors, were similarly obliged to seek the sanction of their tutors ("protectors") for certain actions. Thus, auctoritas characterizes the auctor: The pater familias authorizes – that is, validates and legitimates – his son's wedding in prostate. In this way, auctoritas might function as a kind of "passive counsel", much as, for example, a scholarly authority. After the fall of the Republic, during the days of the Roman Empire, the Emperor had the title of princeps ("first citizen" of Rome) and held the auctoritas principis – the supreme moral authority – in conjunction with the imperium and potestas – the military, judiciary and administrative powers. The notion of auctoritas was often invoked by the papacy during the Middle Ages, in order to secure the temporal power of the Pope. Innocent III most famously invoked auctoritas in order to depose kings and emperors and to try to establish a papal theocracy. Hannah Arendt considered auctoritas a reference to founding acts as the source of political authority in Ancient Rome. She took foundation to include (as augeō suggests), the continuous conservation and increase of principles handed down from "the beginning" (see also pietas). According to Arendt, this source of authority was rediscovered in the course of the 18th-century American Revolution (see "United States of America" under Founding Fathers), as an alternative to an intervening Western tradition of absolutism, claiming absolute authority, as from God (see Divine Right of Kings), and later from Nature, Reason, History, and even, as in the French Revolution, Revolution itself (see La Terreur). Arendt views a crisis of authority as common to both the American and French Revolutions, and the response to that crisis a key factor in the relative success of the former and failure of the latter. Arendt further considered the sense of auctor and auctoritas in various Latin idioms, and the fact that auctor was used in contradistinction to – and (at least by Pliny) held in higher esteem than – artifices, the artisans to whom it might fall to "merely" build up or implement the author-founder's vision and design. ^ J. B. Greenough disputes this etymology of auctor - but not the sense of foundation and augmentation - in "Latin Etymologies", Harvard Studies in Classical Philology, Vol. 4, 1893.